I used a tutorial by Jenni Baker at In Colour Order. It was a great tute and made the makings very easy. The bag was done in a very short time. Thanks heaps Jenni! I so love it! Love the fabrics, and love the size of the bag. I am planning to use it as a little carry bag for my take out sewing. 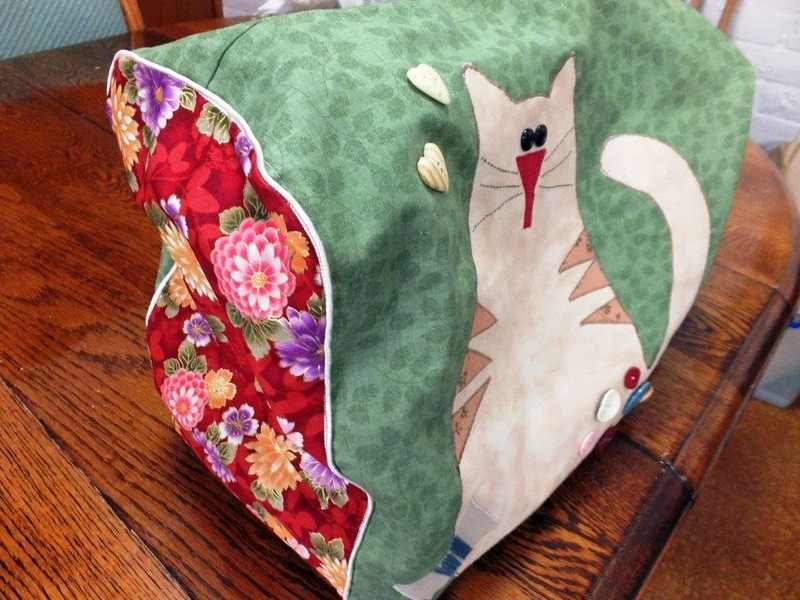 It has soft sides, so will squash up to fit the contents - very useful for take along sewing. Think I'll make another. 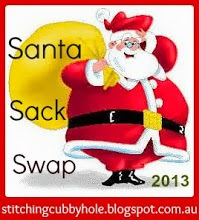 Also on the weekend I finished off another gift for my swap sister in the Santa Sack Swap I'm in. Still some more goodies to do. You will have to wait Lynda, 'cos I'm not even showing a peek. LOL. And no, I didn't make one of these for you! Yesterday was a big day - DH & I drove down to Sydney to meet with Verna, and I gave her the quilt. I think she was a bit blown away. The return journey was pretty horrendous. Terrible traffic and a heavy downpour of rain for the entire length of the drive up the freeway. I was jolly glad to get home. I have been out playing bridge all day, so tonight's post is short and sweet. Have to go and think about making some dinner. BTW I am trialling large photos. Could you leave me a comment and let me know what you think of the new look please? Do you like them large? I know some of you are subscribed to posts by email, so could you email me with your thoughts please. Ta muchly. Very excited that I have finished Verna's Garden! Well, I still have to make a label and sew it on, but the quilting is done and the binding is on. I started it in May at our Retreat and initially when I blogged, I called it "In My Garden", but pretty soon I started to call it "Verna's Garden". This photo and the one below were taken by my lovely friend Raelene. Thank you Rae! You can see our set up at the Retreat, or part of it anyway. I am piecing the centre rail fence blocks with Di in the foreground and Elaine and Diane on the other side of me. 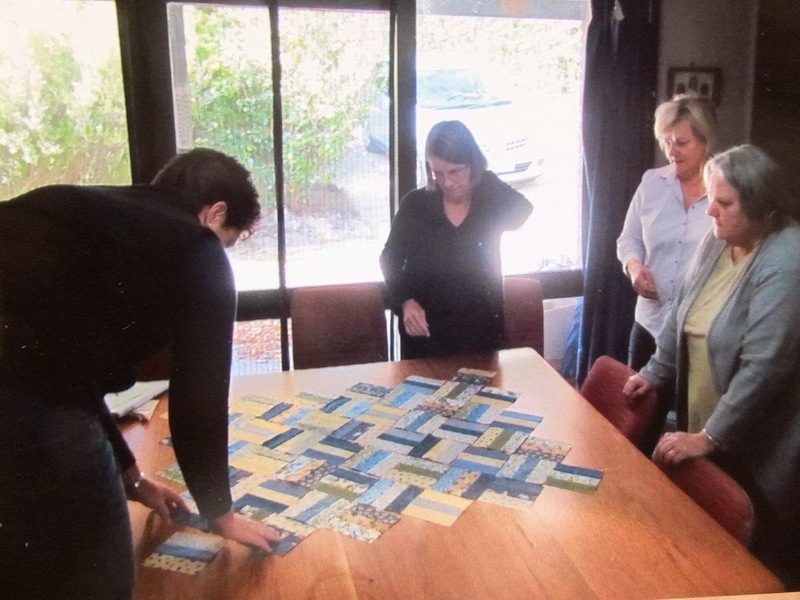 Here we are in the dining room arranging the layout for the centre. Georgina on the left and Diane and Jan on the right. Georgina is ON the table! I have blogged heaps of times, with the first one being here, and another here and here. It has ended up as a large lap quilt, and I love it. I love absolutely everything about it. Funny how sometimes you make things and you can see that they are OK both technically and aesthetically but you aren't in love with it. I quilted the applique border using Isacord thread by outlining each applique shape and then going on to do a moderately tight meander. 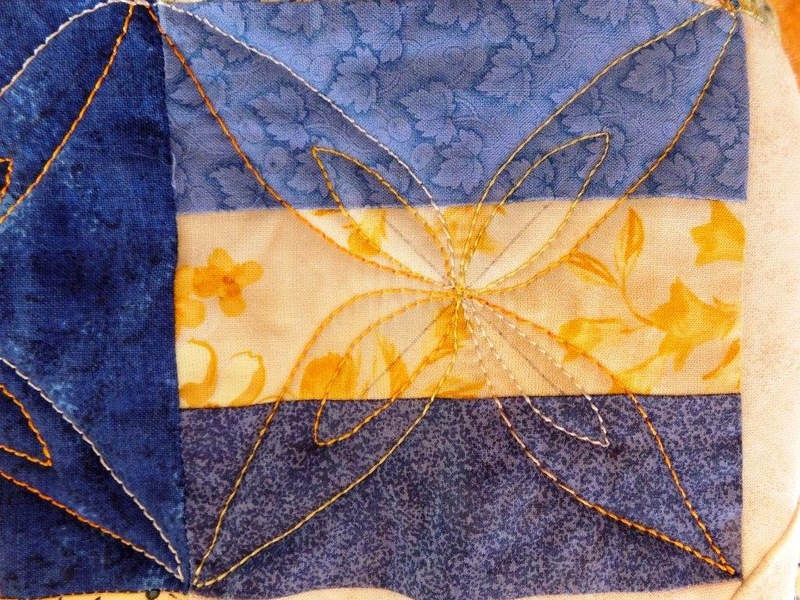 I wanted to continue the theme I used in the centre of the quilt in the outer border, so I did some orange peels freehand, using the Isacord. I am actually deliberating whether I should add another row on the outside of the ones I have done as the borders are a little wavy and that is due to the fact that the meander is quilted more heavily than the border. I don't think I will though. Its finished, so it will stay as it is. I bound it in the same fabric as the last border. I used Wonderfil Accent 12wt Rayon thread in a variegated yellow (ACM36), which I purchased at the Darling Harbour Quilt Show this year on the centre of the quilt. On the two borders I used Isacord 40 Polyester Embroidery thread (colour 101 - an off white) which I purchased online at Sewing Selections. I used a light grey Rasant thread in the bobbin. I buy wadding by the roll from Hollyburton Farm in Victoria. This particular roll was 60/40 Wool/Poly blend. I just love this wadding. It is soft and has a moderate loft; my machine is happy quilting it. I also love the fact that I am buying direct from a farm which supplies its own wool for the wadding! One thing to consider though, is that it is not double width. 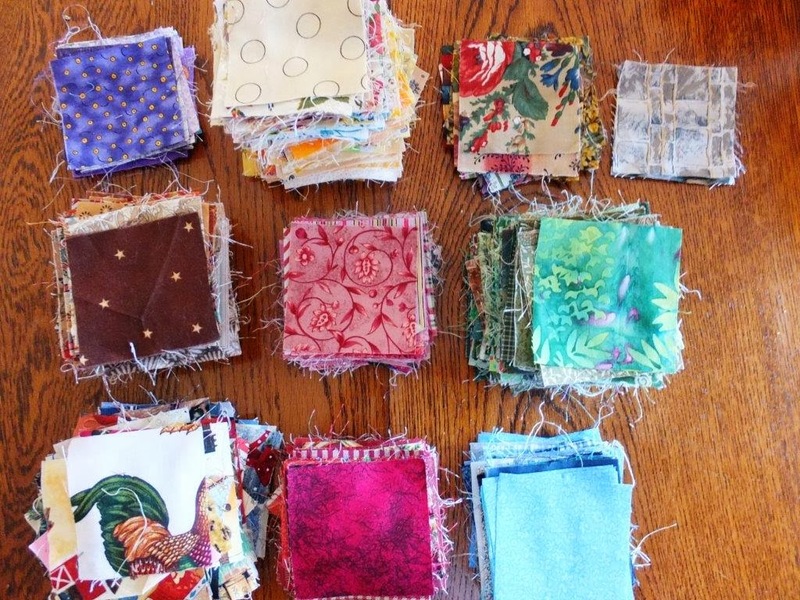 That does not bother me as I any quilts I make which are wider than that I have done on a long arm, as I can't manage them in my machine, and the quilter I use supplies her own wadding. Tibby decided to do a spot of quality assurance the other night while I was in the kitchen making a cuppa. I have decided though that I don't really like machine quilting. 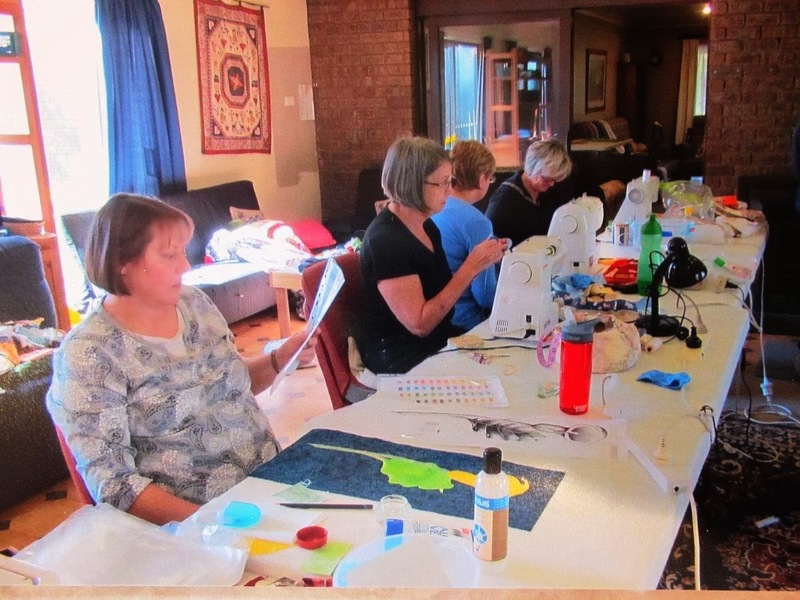 I know that there are people out there who just love the process - my friend Di does gorgeous quilting; then there is Gemma at Pretty Bobbins; Kay Haerland is a quilt artist and lives just a few blocks from me; and of course Leah Day, everyone knows about Leah and her wonderful tutorials. All of these people love FMQ, but for me it is a chore, boring, repetitive, tiresome and simply a means to an end. 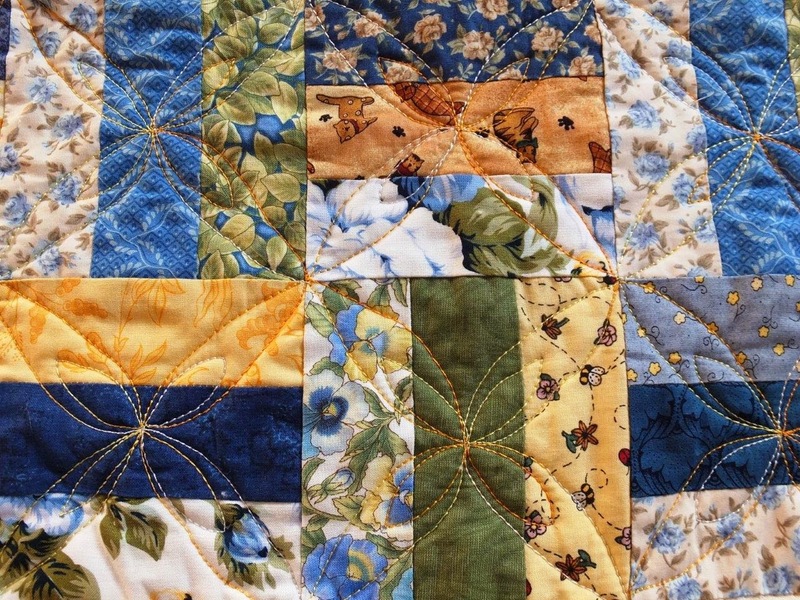 People tell me that my quilting is great, but I am such a particular person that second best just doesn't do, and my quilting in my own eyes does not make the grade. So there I have confessed! 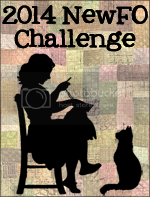 I have linked up this week with TGIFF at Quilter in the Closet. I first blogged about it here. Well on Monday morning my lovely friend Jan came over to spend the morning with me. Nice neat piles of squares and in all different sizes from 2" to 6" in half inch increments. Can you see a tiny bit of my Tibby in the top left hand corner keeping a vigilant eye on proceedings? The pile on the top right is orphan blocks. Strips in 2", 2.5", 3" and 3.5"
And this is the pile of 3" squares. Most were pre-cut and straight out of the bag. There were so many of them that I decided to sort them into piles in colour order. 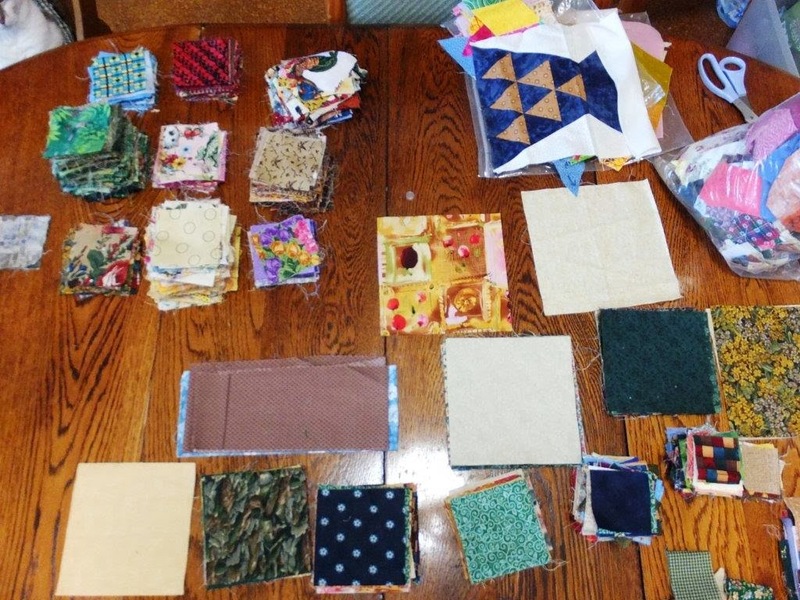 The pile in the bottom left is all feature fabrics and there is enough in that pile alone to make a kids quilt. This girl must have participated in a block swap, there were simply hundreds of them. 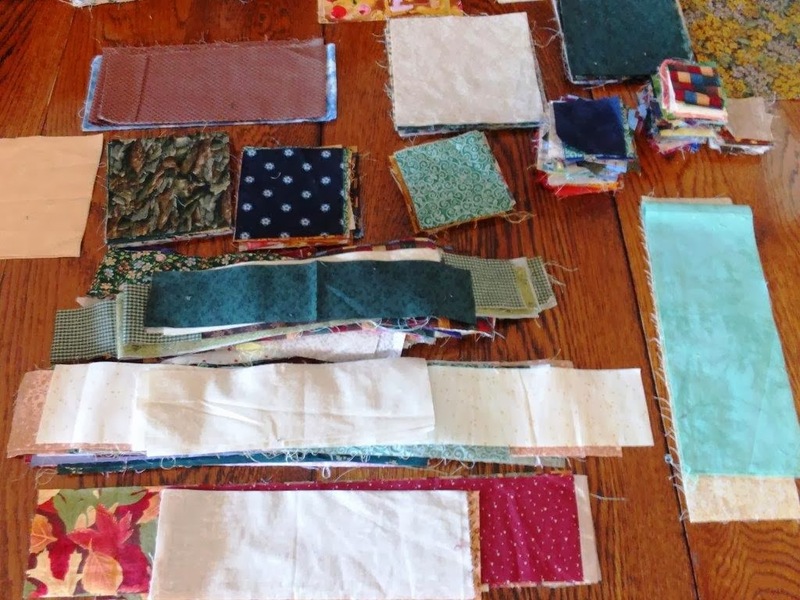 The interesting thing is that once you iron and chop the scraps the whole lot seems to take up an awful lot less room. Nevertheless, I shall have to work out a better way of storing them, as it won't all fit in the storage options I have going at the moment. Bonus is that we have dealt with an entire bag of scraps (the one on the far right in the first photo). Plus! Jan wanted some purple fabrics, so she took home the purple bag (the one second from the right in above photo), and promised to return the scraps all cut and pressed. What a trooper! So grateful to you Jan. There have been some horrific fires in NSW over the last week, with dozens of fires across the state, some of them out of control. The map at the Rural Fire Service (RFS) shows the extent of it. There are 3 fires currently burning in the Blue Mountains just west of Sydney with the township of Springwood being worst hit - 193 homes destroyed already, and the current residents have been evacuated (again). The worst fear is that all 3 of these fires will join up and become a mega fire burning through a fairly densely populated area. The air quality is bad with the smoke quite thick in the air. Interesting sunsets though. 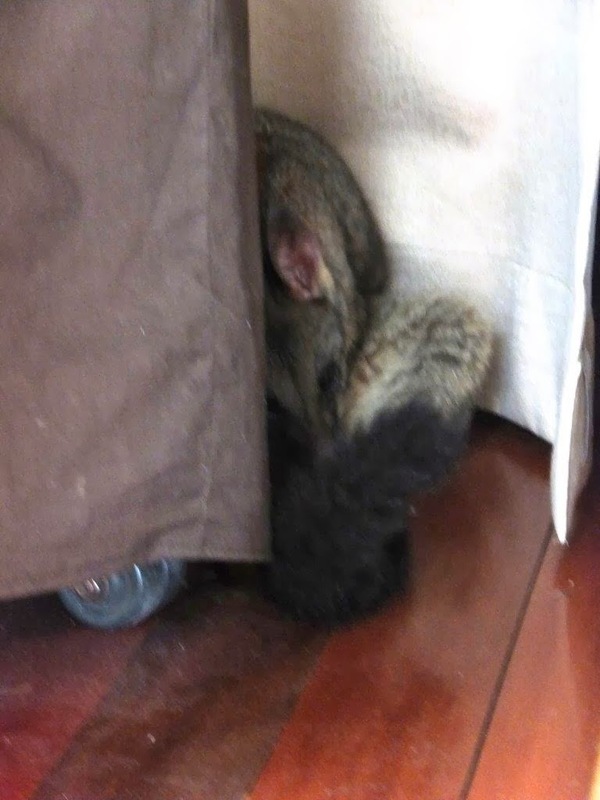 Tibby refuses to go out - she can obviously smell the smoke in the air, and just comes in to hole up in my workroom. 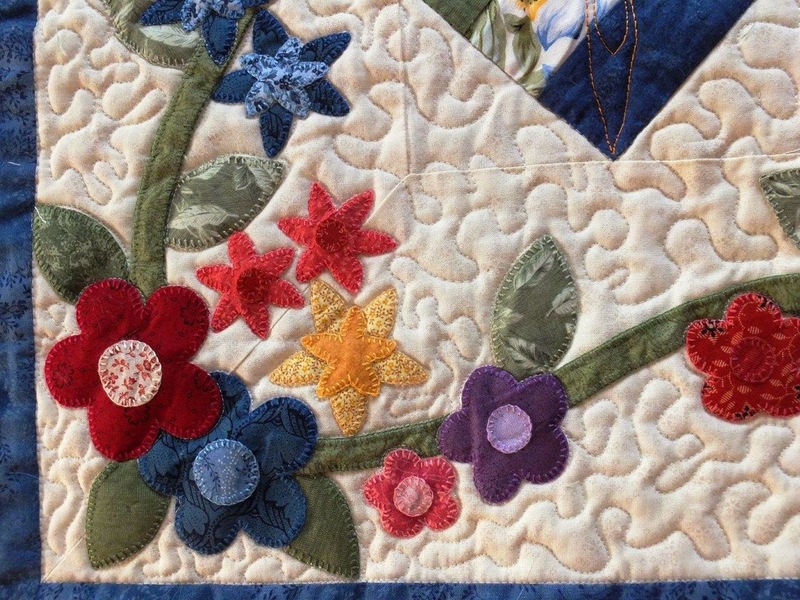 Most of my week has been taken up with quilting Verna's Garden. I am almost finished that and will put up a separate post about that when its done. I am getting stressed about it as it needs to be completed by the 29th. Meanwhile, my shoulders get very tired when I am quilting, so I try to vary the things I do in my sewing room fairly often. I have such a dodgy back, that I really can't push it too much. So.... In between the quilting I picked up my Leader & Ender project, which has now become my main project. 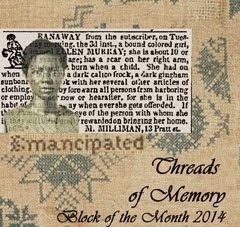 I blogged first about it here. I have now made up 22 Broken Dishes blocks and need 3 more. Cute block eh? Here are some of the others.. 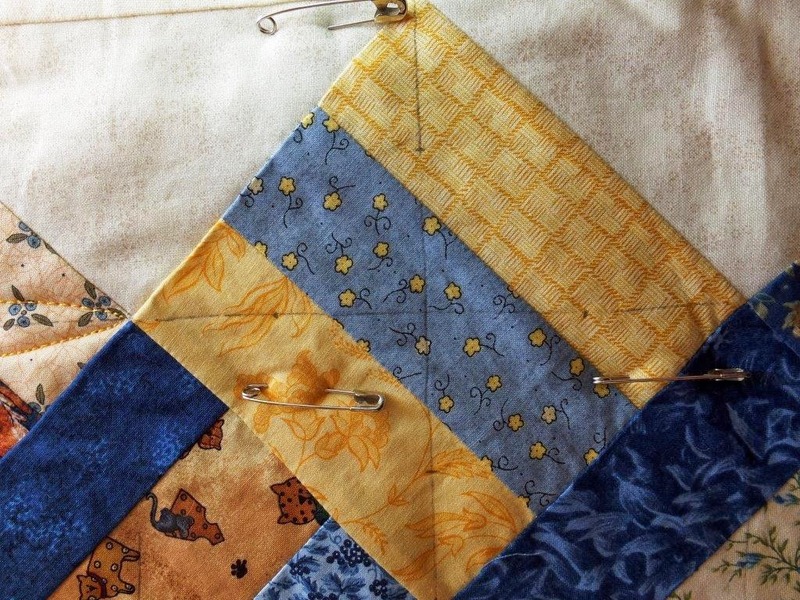 The end result will be a lap quilt for Stitching Hearts. The next step is to sash it with 2" strips (more scraps. Yippee!) and I plan on using corner stones as well out of my 2" scrap bag. (Bonus!!) Not sure where it will be deployed, but most likely to be used as a donation to the Minnamurra Nursing Home, which is our current project. The last couple of Fridays, I have picked up a UFO to complete at Friday Quilters. These blocks were made ages ago. I like to sit and do hand sewing in the evening in front of the TV, so I had put together these hearts which I blanket stitch appliqued onto some light value background fabric. 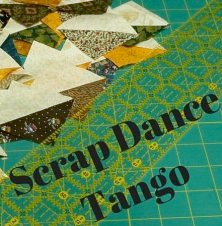 All scraps. So in the last few days, they have had sashing and corner stones added. Corner stones were from some really ugly fabric! Cut it small, and it doesn't look too bad! It was still too small, even for a Stitching Hearts lap quilt, so I added a navy border to frame it. Still too small, so I have cut a bunch of scrappy squares, and am planning an Hour Glass border. These are the test blocks, and have come up as 5" square trimmed. Now me being me, I am flying by the seat of my pants and I have not measured that quilt, so I have no idea if the border will fit! We will just have to be creative if it doesn't. LOL. That's what patchwork is, isn't it? 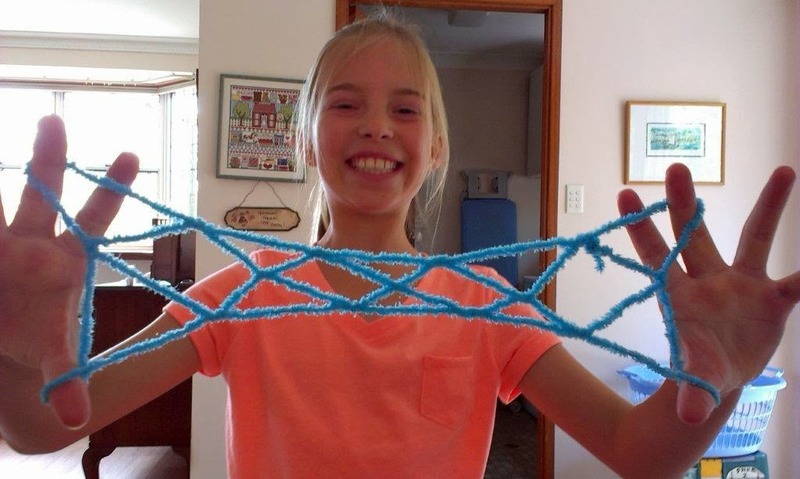 On Thursday last, I went down to Cabarita to Stitching Hearts. 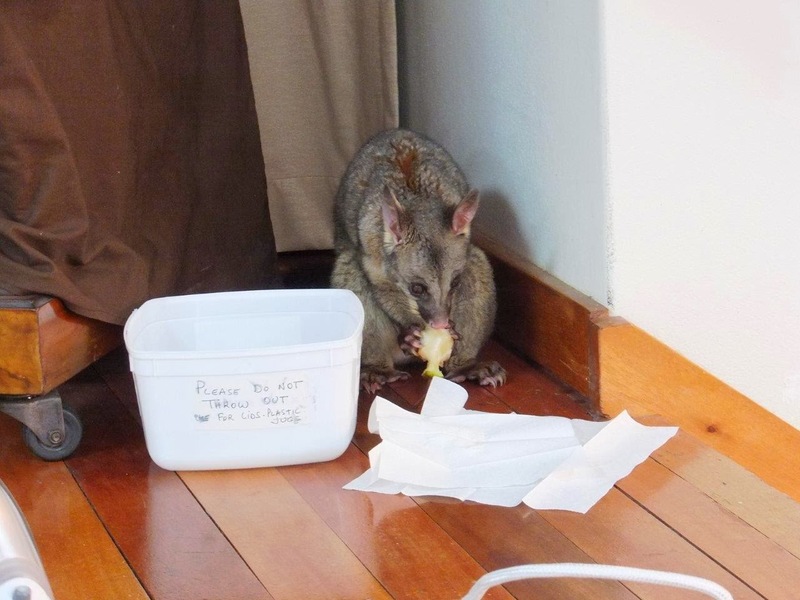 We had a visitor - a dear little Brushtail Possum. Here he is curled up trying to have a snooze up on the stage behind the piano. No idea how he came to be there, but he probably fell through the hole in the ceiling. We rang the Council to have him picked up, but they had not arrived by the time we left. We left out some water, a pear core and a bit of banana. Poor little thing was very thirsty and hungry. These creatures are nocturnal, so the fact that he came out in daylight shows just how hungry he was. Arriving home, I was having a quiet sit at the table in the Family Room. Not sure what made me look up, but I saw this, at the back door. The door is a sliding glass one, but it was ajar in case Tibby wanted to get out for a wander. I leaped up and shut it. Just as well I did, as Tibby did wander up to see what all the fuss was about. Then of course once we were "safe" I had to take a photo or two. This was one BIG baby. 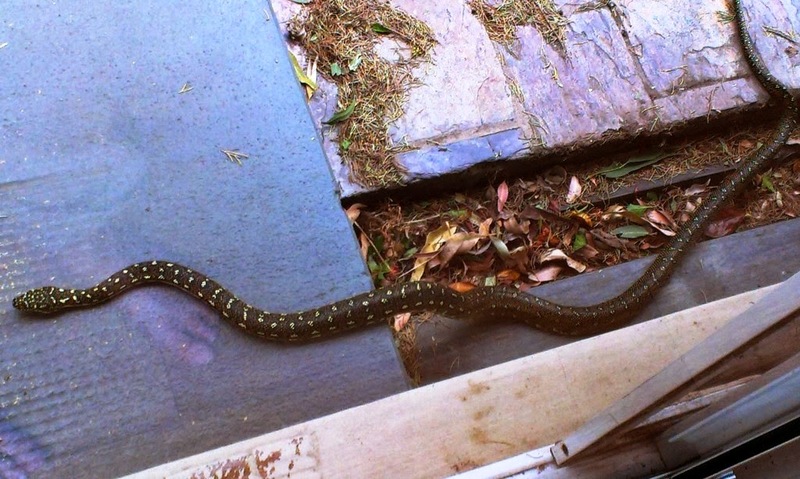 I reckon it was over 4 feet long, and on investigation, I have decided it is a Diamond Python, and non-venomous. That's a relief, but I still wasn't happy about it making free with my back door! This one wasn't full size - apparently they grow to 2 meters! Holy Cow!! 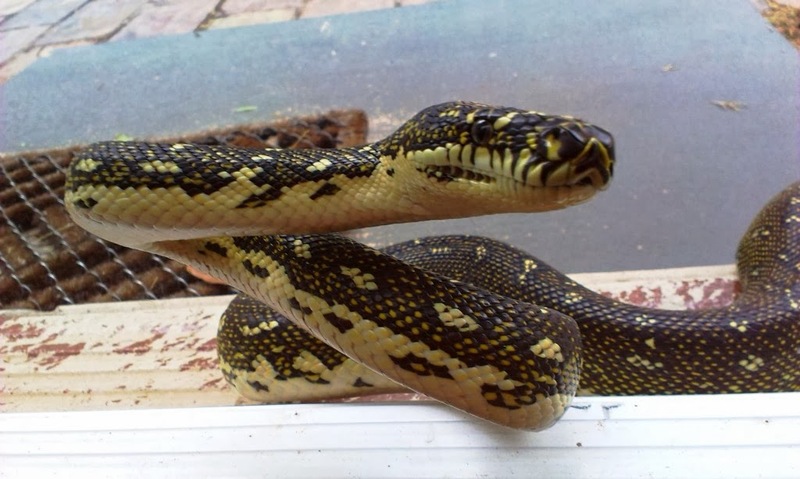 You can read about it on the Australian Reptile Park's web page here. 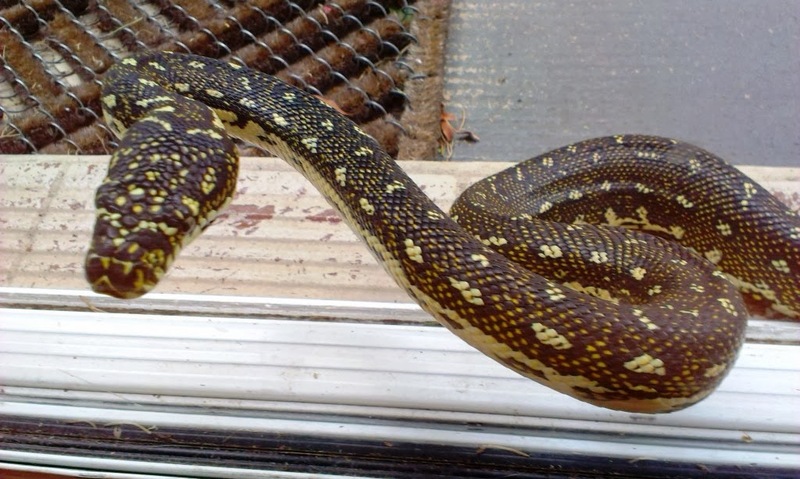 The Reptile Park is not far from here and really good value both for kids and for adults. We often take interstate and overseas guests there. I was dead pleased when it finally got bored looking at all these dumb humans and slithered off out the back gate. 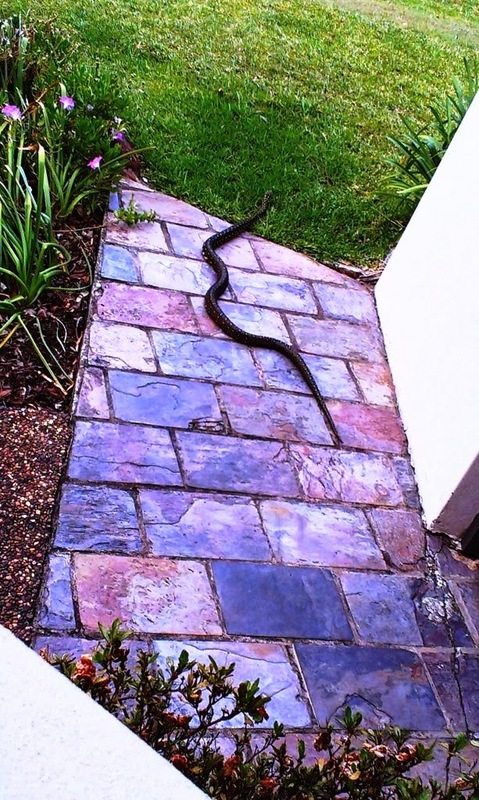 Last sighted slithering up the road - I don't care where it went, as long as it was way out of my garden. 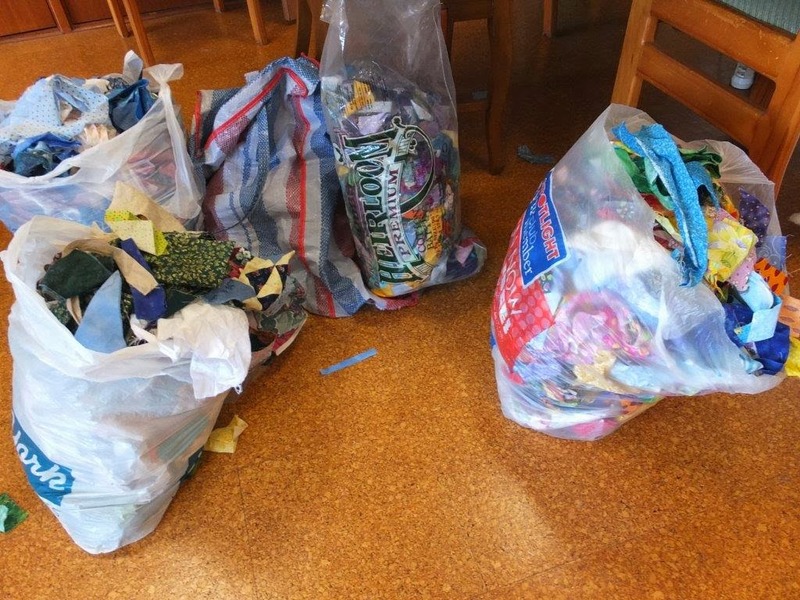 Remember this humongous pile of scraps Jan-Maree gave me a couple of weeks ago? I have been delving into it a little bit at a time whenever I can, and dealing with the bits. I have fished out an enormous pile of pre-cut 3" squares, in every colour. There must be several hundred, and I haven't even emptied one of these bags. Guess I shall have to plan a quilt around them now. 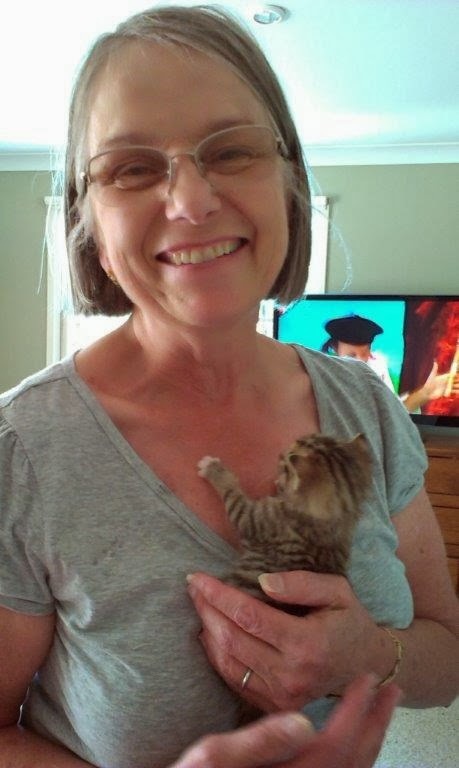 My friend Jan is coming over tomorrow morning to give me a hand to sort them. Bless her. 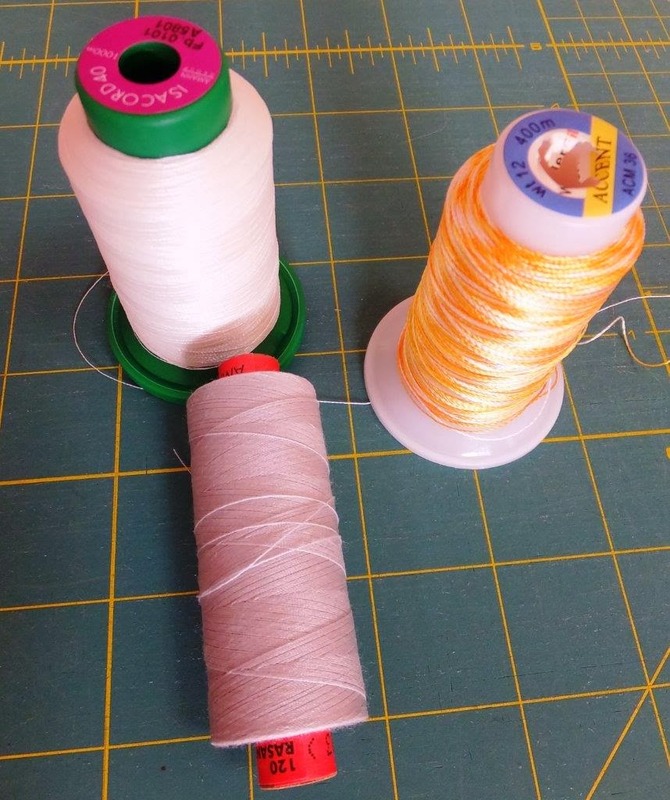 I have linked up with the Show Off Saturday linky at Caroline's Sewshecan blog. Why not pop over there to take a look at some of the inspirational blogs listed? Well Procrastination Polly was (temporarily) vanquished to the delight of WorryWort Wendy and Anxious Angela. 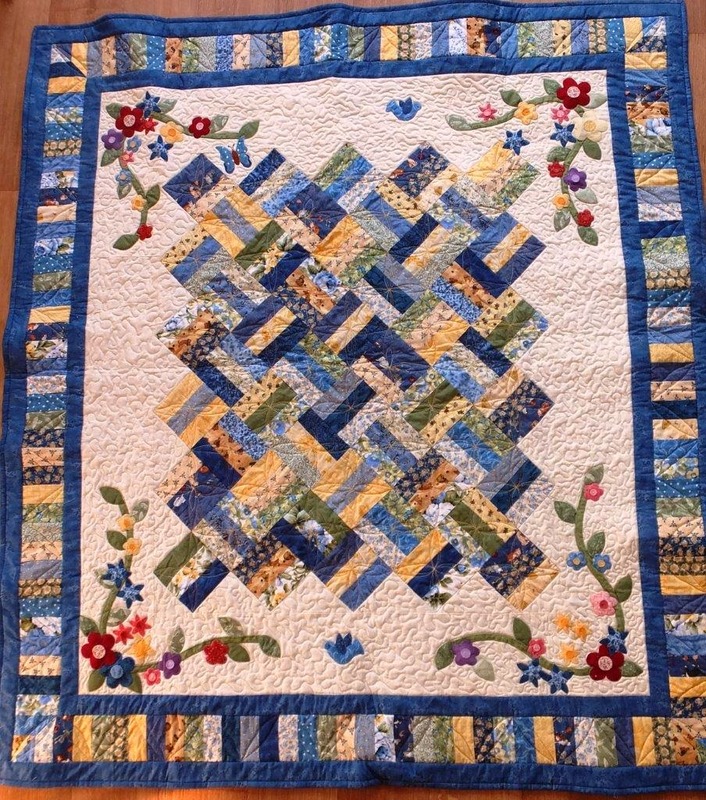 I got to it on Saturday and began the quilting on Verna's Garden. Over the weekend I have completed the whole of the blue/yellow pieced centre. The next step is the applique border. I find the hardest thing is actually deciding what to do. 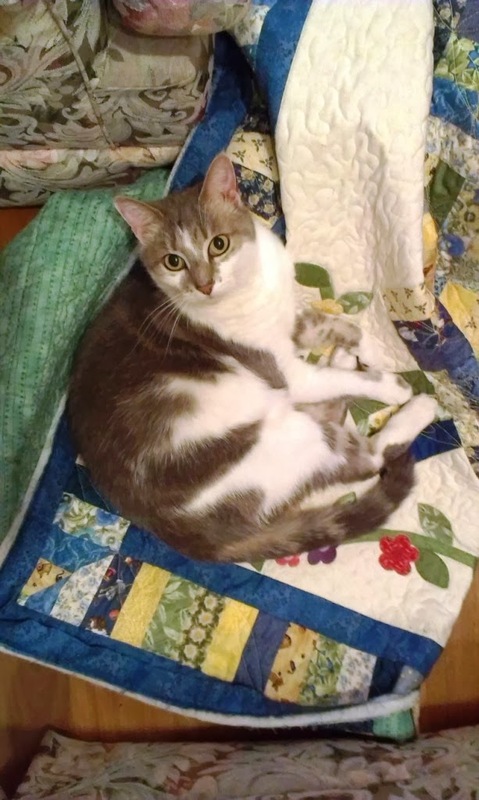 In some cases, the quilt just looks at me and begs to be quilted just so, and the whole process is easy peasy. 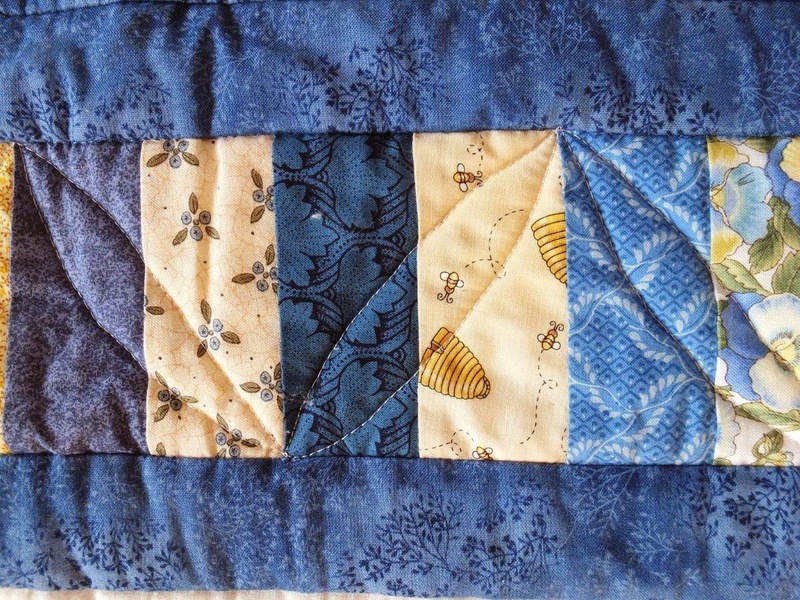 This one however, is a quilt I just love, and I desperately wanted to do a good job on it and not spoil it. So I agonised for a couple of weeks on the thread to use, and on the design to do. I ended up using the book "Free-Motion Quilting Made Easy" by Eva A. Larkin, published by That Patchwork Place for inspiration. It is not a new book, but I think you can still get it. Eva Larkin shows you how to quilt 8 simple shapes, then expands them into 186 different designs, which, although they look complicated, are actually just the first 8 shapes combined in different ways. I love this book! I used a variegated yellow thread from the Wonderfil Accent range. The promotional blurb states that this is a 12wt - 2 ply rayon. The recommended needle size is a 14/90 Metallic needle, which is what I used. It is not a thread my machine is terribly happy with, and I found that the thread shredded on several occasions - very frustrating! The backing is a funny sort of slightly bluey green, so I used a pale grey Rasant thread in the bobbin. My beautiful daughter came over a week or so ago, and presented me with a present. 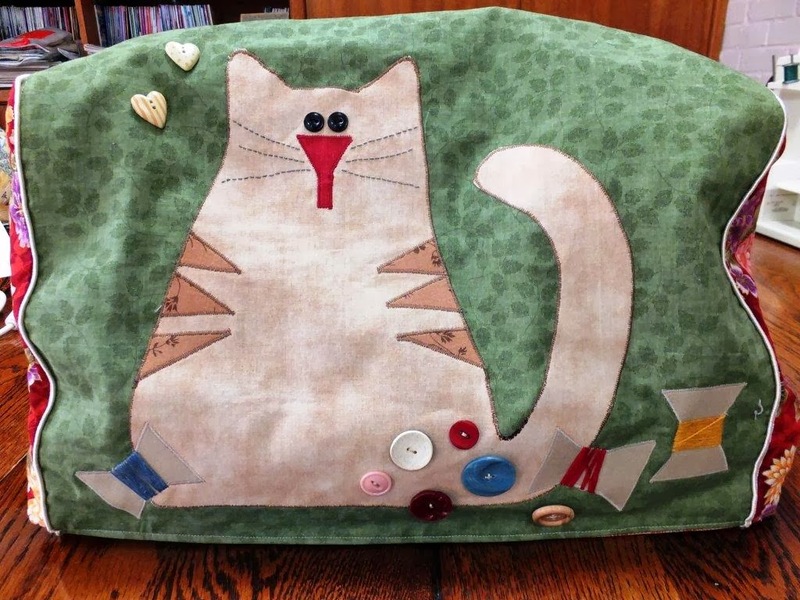 I haven't shown it before - its a gorgeous sewing machine cover. Isn't she a doll?? The ends are made from a pretty Japanese fabric. I have it over my antique 99K Singer, which was also a gift from her. 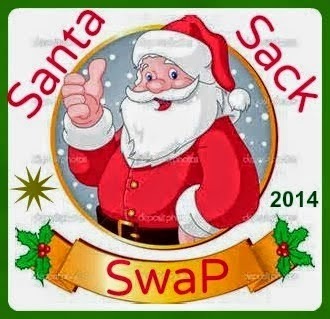 I can't show you the next three things I have made over the last few days as they are for the Christmas Swap, and I don't want my swap buddy peeking! Suffice to say that on Friday I finished an item I have been hand sewing for a while in between other things, and on Sunday I made two more items. Love them all! Hope you do too Lynda. My daughter called on Sunday afternoon, and suggested that I pop over. Her youngest sister runs Coastal Pet Rescue and needed some kittens minded for a few hours while she went to the Vet. These 3 kittens were left in a garbage bin only a few days old! How can people do this?? Irrespective of whether you like cats or not, this is simply not the thing to do to a living creature! Here is Fat Albert, he had just been fed & was fast asleep in seconds. So cute! I want them all. I have absolutely no idea what it is - just another in a line up of Weird & Wonderful Creatures who have come to visit us! It is about 1.5" long. I think the "head" is the top bit, but no amount of peering could confirm this, and it seems to have "whiskers" at the top. Can you see them? 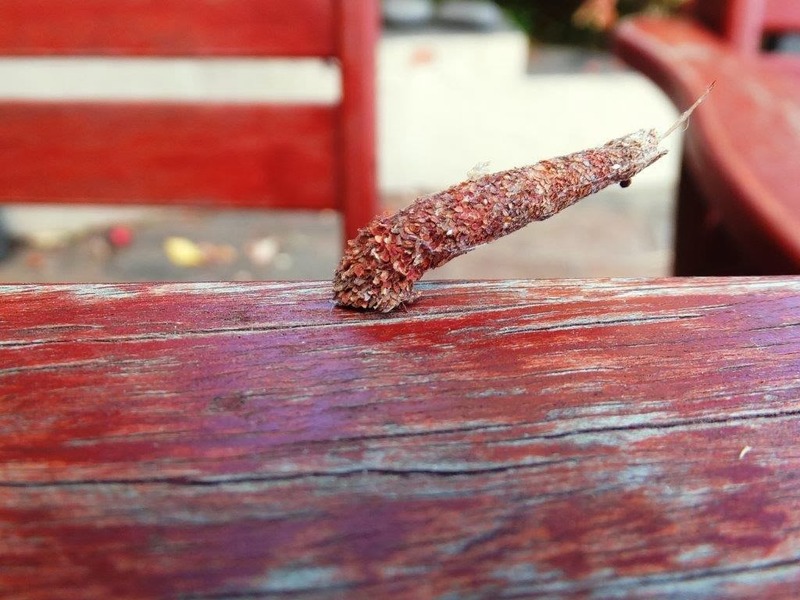 Its "feet" seem to be attached to the table. He moves at an incredible rate of knots when he gets going. Monday last week was a Public Holiday and also the last day of the School Holidays here, so Miss 10 came over to spend a couple of hours with me. We baked a yummy slice, and then she begged some wool off me. 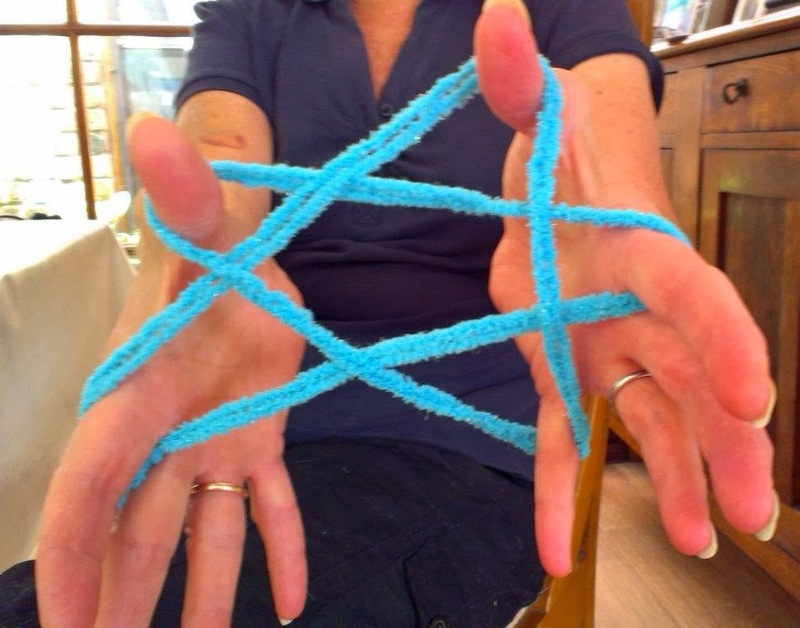 We proceed to play "strings", although in my day I think I called it "elastics". With enormous confidence I prepared to make the "Cats Whiskers", but failed miserably!! Don't ask me to repeat it. LOL. That's why there is a photo for posterity! Anyone who has read my blog for a while may have noticed that I hardly ever post a blog on Tuesdays. 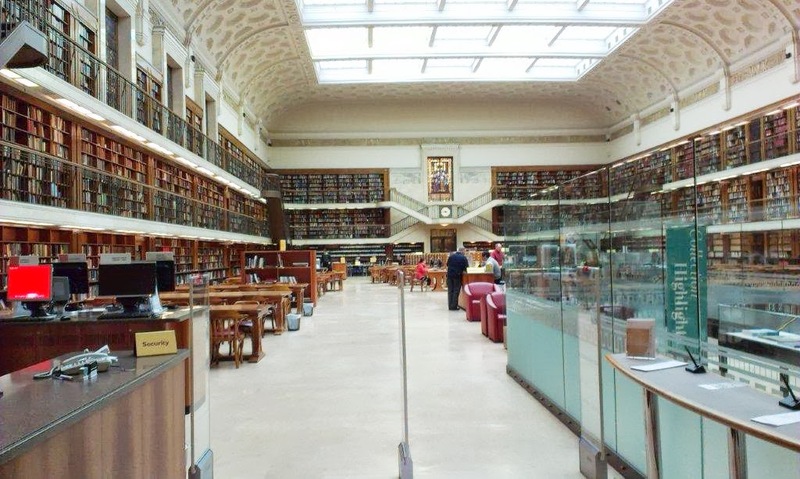 That is because since the beginning of this year I have been travelling down to Sydney on Tuesdays to work on a research project at the Mitchell Library. The day begins early, well for me anyway, as I like to be on the 7.25 bus to the station. If I leave much later, then it is a late start and not much gets done. About 9.30am I emerge from the cavernous railway tunnels of commuterland, into daylight at Martin Place. 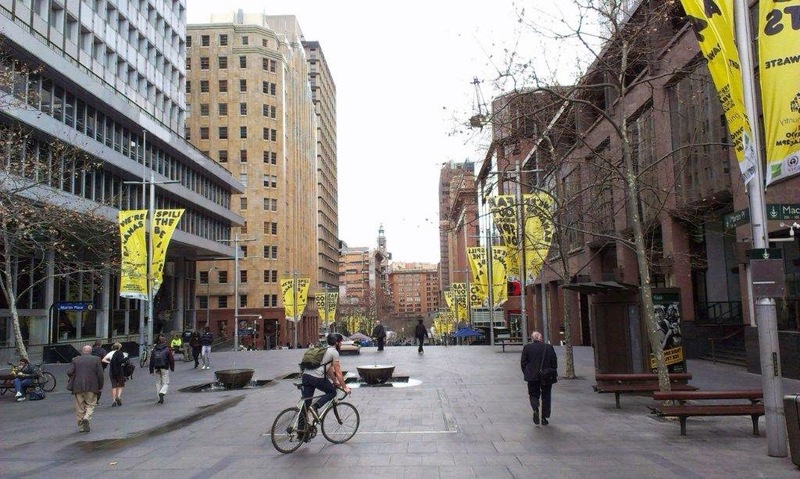 Martin Place is a pedestrian mall, which runs east/west from George Street up to Macquarie Street. For those unfamiliar with Sydney that is 4 city blocks. This is looking back towards George Street from the station entrance. In the centre background, you can just about make out the clock tower on the GPO, and on the left is the Reserve Bank. Most of the major banks have their head office in this short stretch of roadway. Out of the photo and in front of the GPO is the Cenotaph commemorating the fallen soldiers of the two World Wars. Also not visible, is the small amphitheatre in which there are often free concerts during lunch hour. This was part of the Sydney Art & About Festival. 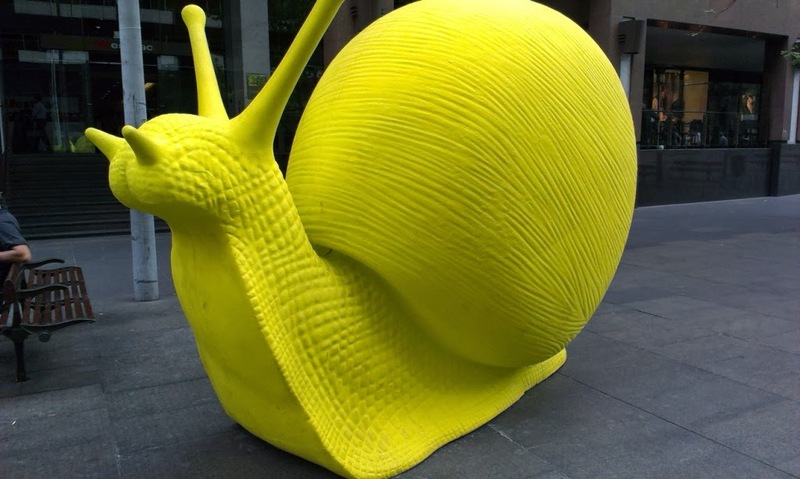 The website states that it is a festival of art in unusual place, and the snails are Snailovation display. I came across another of these outside the Mitchell Library. 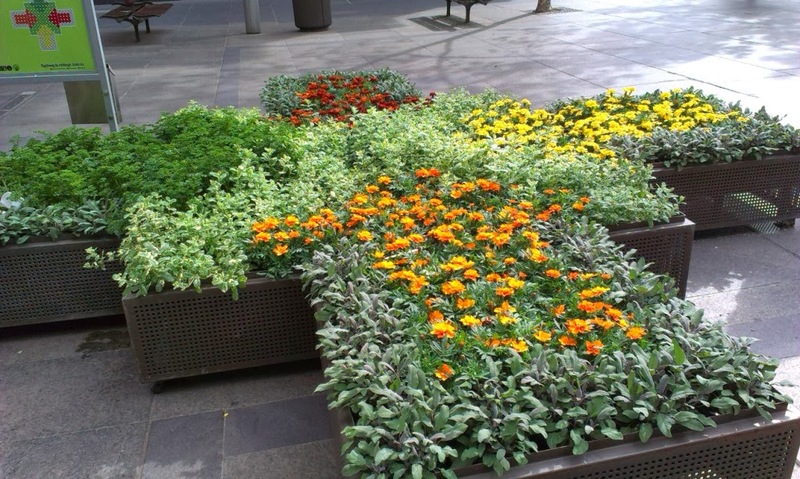 I had to giggle - the lush green foliage on the left is actually parsley, and the blue grey in the front is sage! I also spied some mint in there too amongst the marigolds. 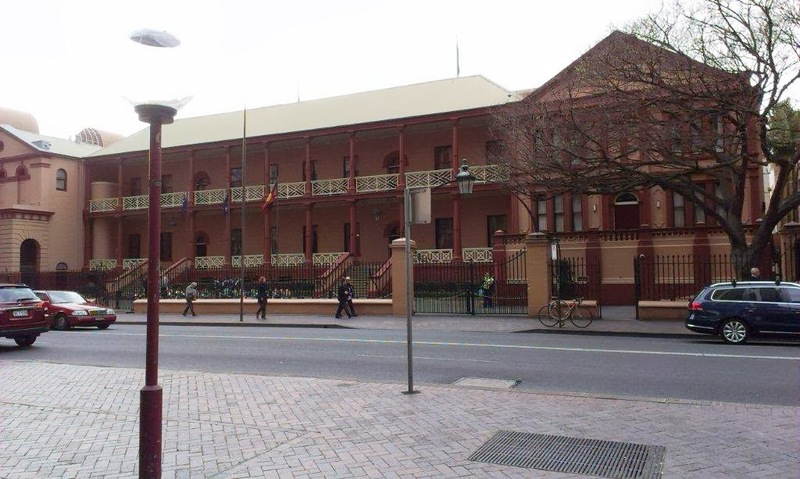 Turning around to face up to Macquarie Street you spy Parliament House. The oldest part of the building, which you can see here is a two storey Georgian building. 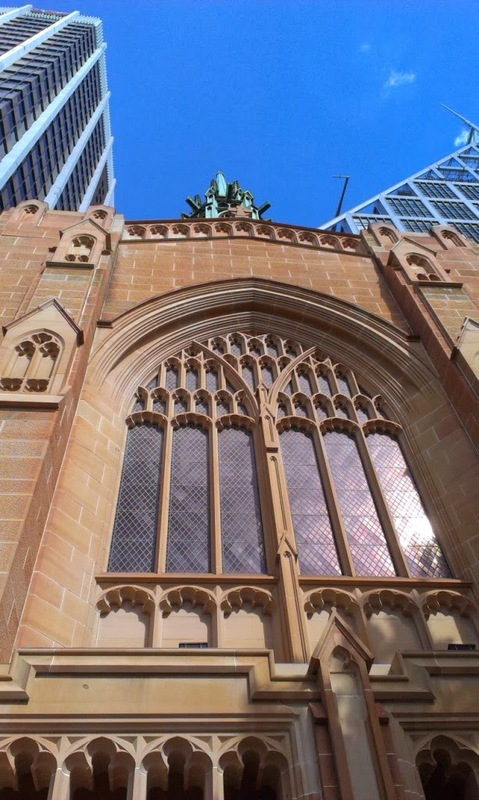 Walking down Macquarie Street towards Circular Quay (north), one of the first buildings you come to is St Stephen's Uniting Church. The congregation began in 1842, and moved to the present building in 1935. I was lucky enough to walk past it one day recently when the choir & orchestra were practising for a recital, so I slipped in for a freebie concert. The interior is wonderful, with some truly stunning stained glass windows. The choir was pretty good too! I loved the contrast of the old and new architecture as you look up. 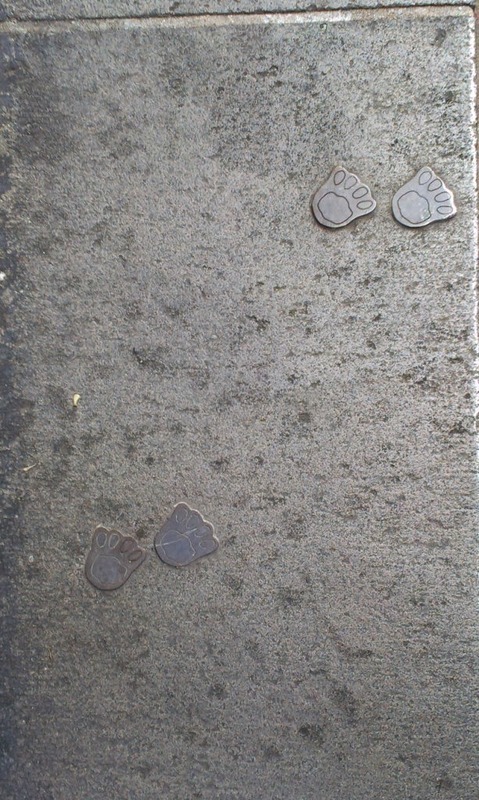 A plaque set into the footpath in front of the church told me that this was the site of Burdekin House, built in 1841 for Thomas Burdekin, an ironmonger and alderman. 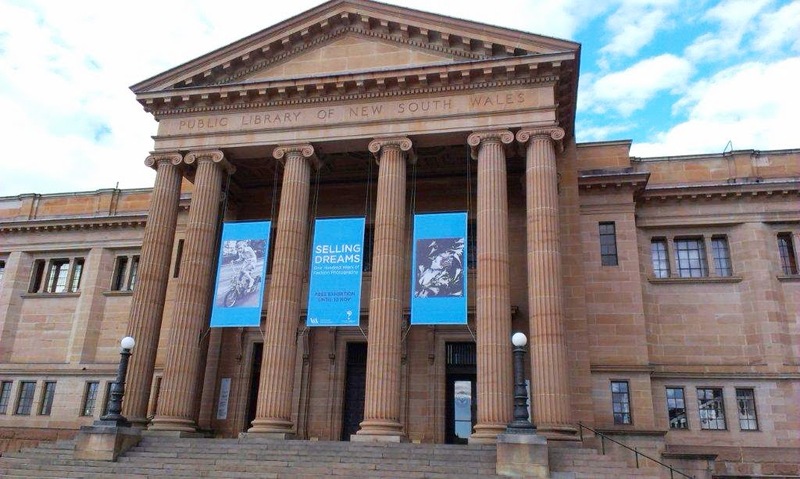 It was one of Sydney's most fashionable houses in its day. I like to look up when I pass an old building, and the one next door is No. 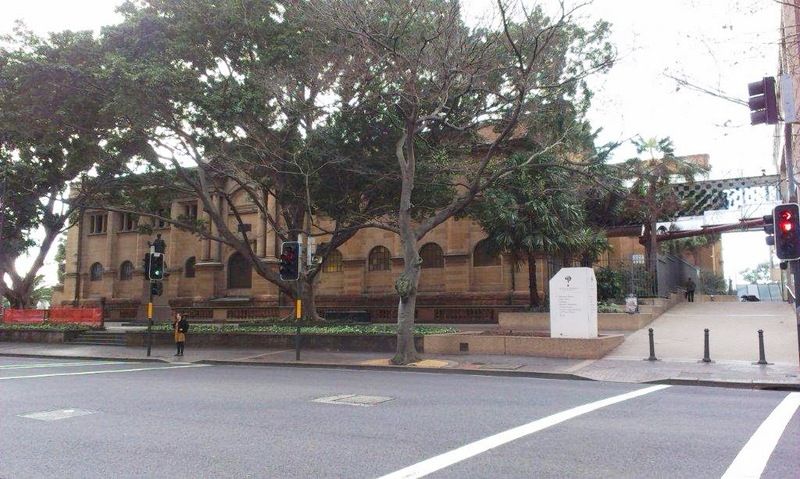 193 Macquarie Street, or Hengrove Hall which is home to a bevy of Medical Specialists. Looking up this time was a bonus! spirit of an English manor house of the Sixteenth Century, with panelled interior walls, parquetry floors, and hand-wrought period lighting fixtures and door furniture. 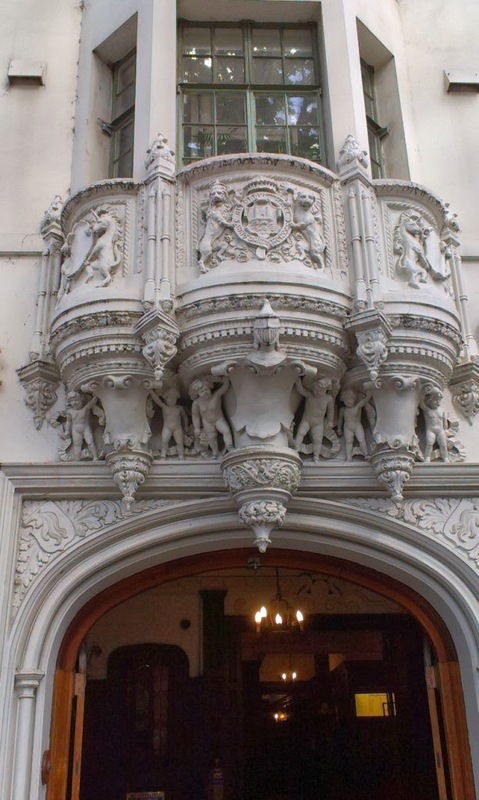 One of the most striking fixtures is the entrance doorway, which is closely modelled on the design of the Gate House of Hengrave Hall, Suffolk, a manor house of the early English Renaissance period, completed In 1538. ....... The central coat of arms is composite, embodying the original coat of arms and the crest of Hengrave Hall." 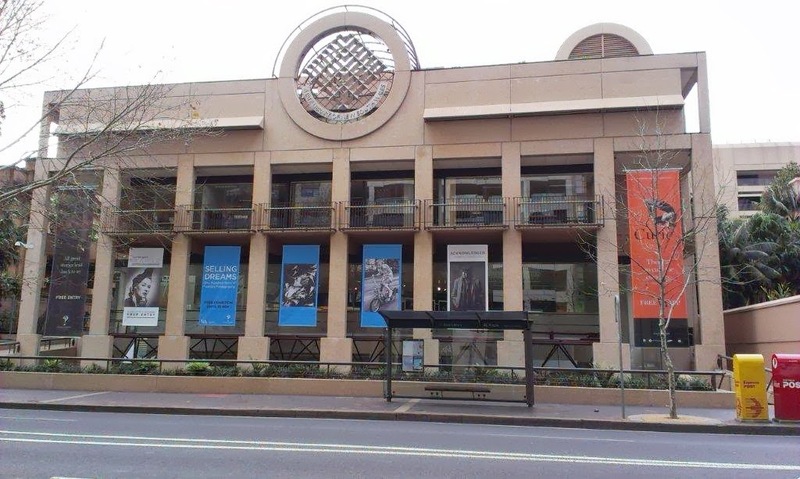 Across the road, and almost opposite is the modern State Library. And next door to that, connected by a walk way is the Mitchell Library, built in 1910 to house a growing collection of rare original manuscripts. 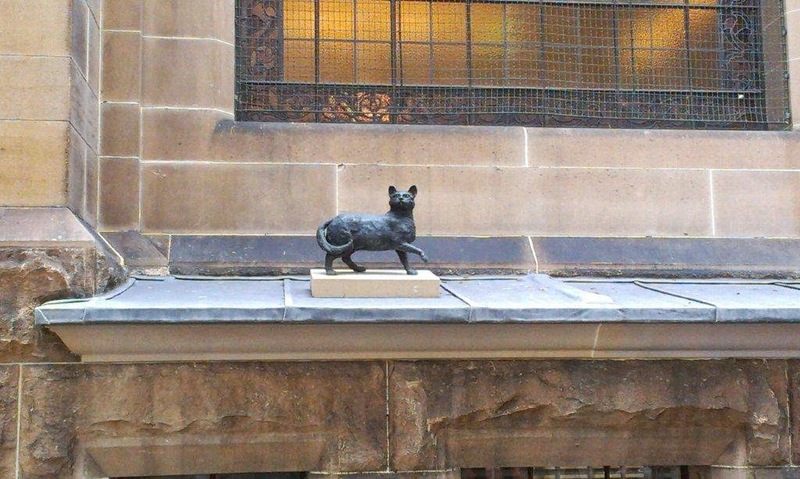 In front of the library and facing Macquarie Street, is a statue in honour of Matthew Flinders. 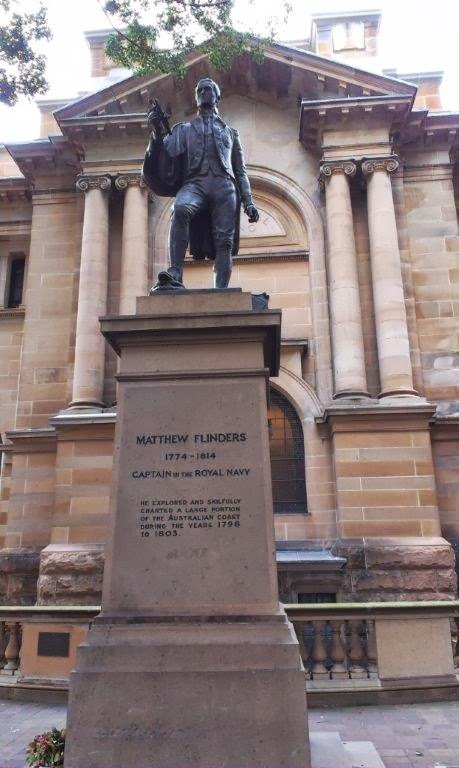 Matthew Flinders was a prominent explorer an the first to circumnavigate Australia and identify it as a continent. 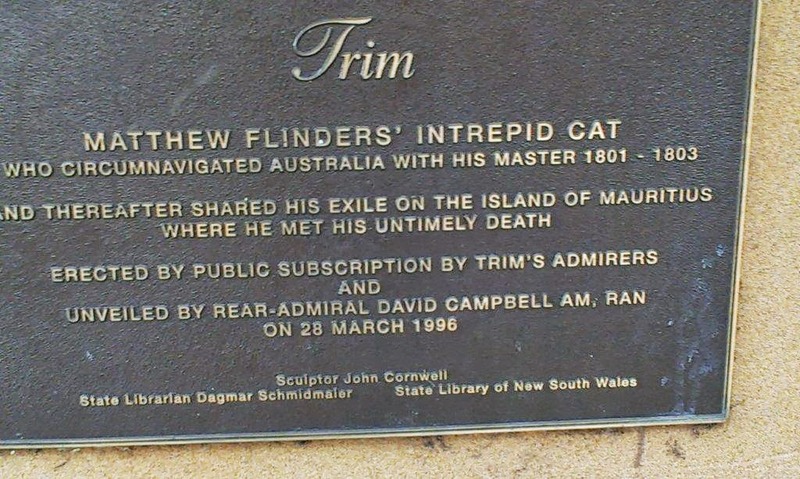 A statue of Trim, Matthew Flinders' beloved cat, who accompanied him on all his voyages. 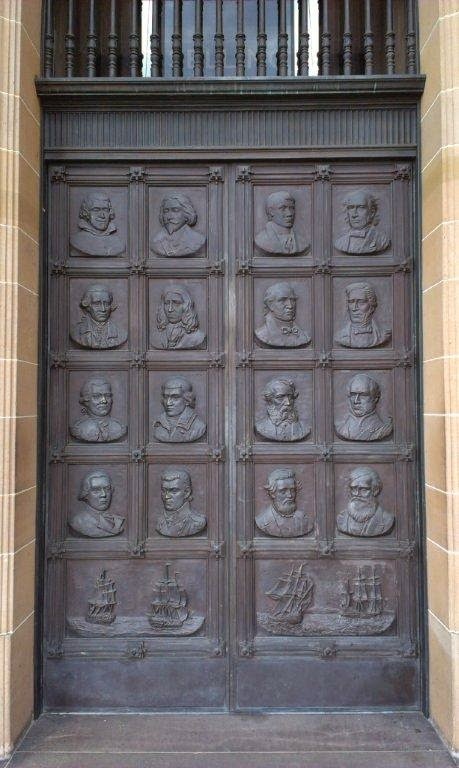 This pair of bronze doors depict the explorers. The other pair show aboriginal scenes. Looking down, this is a marble mosaic reproduction of the Tasman Map, which "is hand drawn on delicate Japanese paper. It bears the arms of the City of Amsterdam. 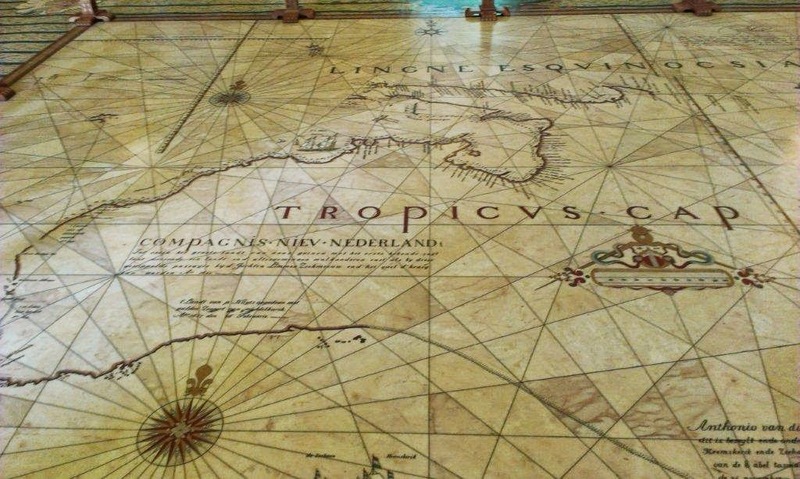 Just below the Tropic of Capricorn are the tracks of Abel Tasman's two ships Heemskerck and Zeehaen. The map combines the results of Tasman's first (1642-43) and second (1644) voyages with those of earlier Dutch navigators. It shows a surprisingly accurate general outline of Australia." 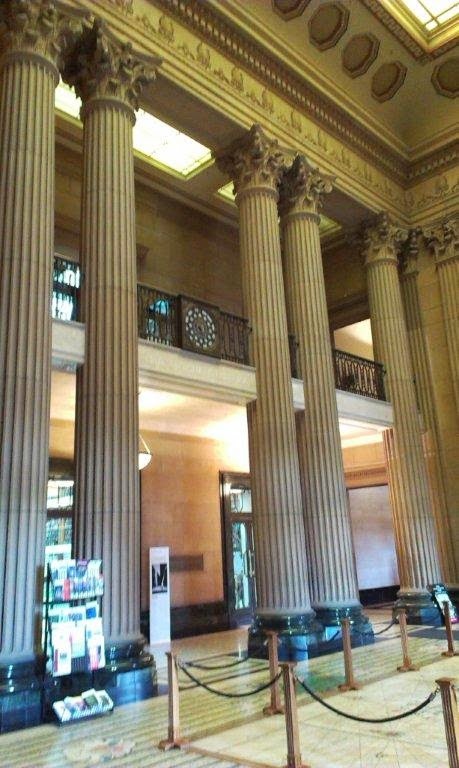 And this is the library itself, where I spend the next 5 hours, in the hallowed manuscript section. So now you know why I don't blog on Tuesdays.